Brussels (French: Bruxelles [bʁysɛl] (listen); Dutch: Brussel [ˈbrʏsəl] (listen)), officially the Brussels-Capital Region (French: Région de Bruxelles-Capitale; Dutch: Brussels Hoofdstedelijk Gewest),[a] is a region of Belgium comprising 19 municipalities, including the City of Brussels, which is the capital of Belgium. The Brussels-Capital Region is located in the central portion of the country and is a part of both the French Community of Belgium and the Flemish Community, but is separate from the Flemish Region (in which it forms an enclave) and the Walloon Region. Brussels is the most densely populated and the richest region in Belgium in terms of GDP per capita. It covers 161 km2 (62 sq mi), a relatively small area compared to the two other regions, and has a population of 1.2 million. 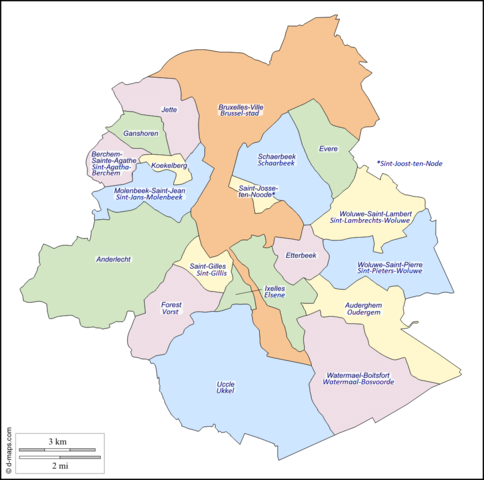 The metropolitan area of Brussels counts over 2.1 million people, which makes it the largest in Belgium. It is also part of a large conurbation extending towards Ghent, Antwerp, Leuven and Walloon Brabant, home to over 5 million people. Libraries in Brussels fall under the competence of the Communities and are usually separated between French-speaking and Dutch-speaking institutions, although some are mixed. The Brussels-Capital Region has three main train stations: Brussels-South, Central and North, which are the busiest of the country. Brussels-South is also served by direct high-speed rail links: to London by Eurostar trains via the Channel Tunnel (1hr 51min); to Amsterdam by Thalys and InterCity connections; to Amsterdam, Paris (1hr 50min and 1hr 25min respectively as of 6 April 2015), and Cologne by Thalys; and to Cologne (1hr 50min) and Frankfurt (2hr 57min) by the German ICE. ^ Dutch pronunciation: [ˈbrʏsəls ɦoːftˈsteːdələk xəˈʋɛst] (listen). Gewest in isolation is pronounced [ɣəˈʋɛst]. ^ a b c Herbez, Ariel (30 May 2009). "Bruxelles, capitale de la BD". Le Temps (in French). Switzerland. Retrieved 28 May 2010. Plus que jamais, Bruxelles mérite son statut de capitale de la bande dessinée. ^ "CIJFERS - Bevolking - BHG 2017". www.briobrussel.be. Retrieved 29 October 2018. ^ a b News, TBT. "The Brussels Times - Brussels North is Belgium's busiest train station". Retrieved 3 August 2018. On the morning of 22 March 2016, three coordinated suicide bombings occurred in Belgium: two at Brussels Airport in Zaventem, and one at Maalbeek metro station in central Brussels. Thirty-two civilians and three perpetrators were killed, and more than 300 people were injured. Another bomb was found during a search of the airport. The Islamic State of Iraq and the Levant (ISIL) claimed responsibility for the attacks.The perpetrators belonged to a terrorist cell which had been involved in the November 2015 Paris attacks. The Brussels bombings happened shortly after a series of police raids targeting the group. The bombings were the deadliest act of terrorism in Belgium's history. The Belgian government declared three days of national mourning. The Brussels Agreement (Serbian: Бриселски споразум / Briselski sporazum, Albanian: Marrëveshja e Brukselit) was made between the governments of Serbia and Kosovo on the normalization of their relations. It was negotiated and concluded, although not signed by either party, in Brussels under the auspices of the European Union. The negotiations were led by Serbian Prime Minister Ivica Dačić and Kosovo Prime Minister Hashim Thaçi, and mediated by EU High Representative Catherine Ashton. The agreement was concluded on 19 April 2013. The company operating the airport is known as The Brussels Airport Company N.V./S.A. ; before 19 October 2006, the name was BIAC (Brussels International Airport Company), which was created by Belgian law through a merger of BATC with the ground operations departments of the RLW/RVA. Since 2011, the airport has been owned by the Toronto-based Ontario Teachers' Pension Plan (39%), Macquarie Group (Macquarie European Infrastructure Fund I and Macquarie European Infrastructure Fund III) (36%) and the Belgian State (25%).On 22 March 2016 the airport's departures hall was severely damaged by two terrorist bomb blasts. The airport was closed until 3 April 2016, when it reopened with temporary facilities at less than 20% of its previous capacity. It has since returned to full operations, with a record of 90,000 passengers on 29 July 2016. As of 1 January 2017, the City of Brussels had a total population of 176,545. The total area is 32.61 km2 (12.59 sq mi) which gives a population density of 5,475 inhabitants per square kilometre (14,180/sq mi). As of 2007, there were approximately 50,000 registered non-Belgians in the City of Brussels. In common with all the Brussels municipalities, it is legally bilingual (French–Dutch). Eurostar is a high-speed railway service connecting London with Amsterdam, Avignon, Brussels, Lille, Lyon, Marseille, Paris, and Rotterdam. All its trains traverse the Channel Tunnel between the United Kingdom and France, owned and operated separately by Getlink. The London terminus is St Pancras International, the other British calling points being Ebbsfleet International and Ashford International in Kent. Intermediate calling points in France are Calais-Fréthun and Lille-Europe, with trains to Paris terminating at Gare du Nord. Trains to Belgium terminate at Midi/Zuid station in Brussels. The only intermediate calling point in the Netherlands is Rotterdam Centraal, with trains terminating at Amsterdam Centraal. In addition, there are limited services from London to Disneyland Paris at Marne-la-Vallée – Chessy, direct services to southern France (Lyon, Avignon and Marseille) from May to September (launched on 1 May 2015), and seasonal direct services to the French Alps in winter (December to April). The service is operated by eighteen-car Class 373/1 trains and sixteen-car Class 374 trains which run at up to 300 kilometres per hour (186 mph) on a network of high-speed lines. The LGV Nord line in France opened before Eurostar services began in 1994, and newer lines enabling faster journeys were added later—HSL 1 in Belgium and High Speed 1 in southern England. The French and Belgian parts of the network are shared with Paris–Brussels Thalys services and also with TGV trains. In the United Kingdom the two-stage Channel Tunnel Rail Link project was completed on 14 November 2007 and renamed High Speed 1, when the London terminus of Eurostar changed from Waterloo International to St Pancras International. Until 2010, Eurostar was operated jointly by the national railway companies of France and Belgium, SNCF and SNCB/NMBS, and Eurostar (UK) Ltd (EUKL), a subsidiary of London and Continental Railways (LCR), which also owned the high-speed infrastructure and stations on the British side. Eurostar has become the dominant operator on the routes that it operates, carrying more passengers than all airlines combined. Other operators have expressed an interest in starting competing services following deregulation in 2010. On 1 September 2010, Eurostar was incorporated as a single corporate entity called Eurostar International Limited (EIL), replacing the joint operation between EUKL, SNCF and SNCB/NMBS. EIL is owned by SNCF (55%), Caisse de dépôt et placement du Québec (CDPQ) (30%), Hermes Infrastructure (10%) and NMBS (5%).In June 2014, the UK shareholding in Eurostar International Limited was transferred from London and Continental Railways / Department for Transport to HM Treasury. That October, it was announced that the UK government planned to raise £300 million by selling that stake. In March 2015, the UK government announced that it would be selling its 40% share to an Anglo-Canadian consortium made up of Caisse de dépôt et placement du Québec and Hermes Infrastructure. This sale was completed in May 2015. Expo 58, also known as the Brussels World’s Fair (Dutch: Brusselse Wereldtentoonstelling, French: Exposition Universelle et Internationale de Bruxelles), was held from 17 April to 19 October 1958. It was the first major World Expo registered under the Bureau International des Expositions (BIE) after World War II. The Flemish Region (Vlaams Gewest, pronounced [ˌvlaːms xəˈʋɛst] (listen); French: Région flamande) is one of the three regions of the Kingdom of Belgium—alongside the Walloon Region and the Brussels-Capital Region. Colloquially, it is usually simply referred to as Flanders. It occupies the northern part of Belgium and covers an area of 13,522 km2 (44.29% of Belgium). It is one of the most densely populated regions of Europe with around 480 inhabitants per square kilometer. In Belgium, the French Community (French: Communauté française; French pronunciation: ​[kɔmynote fʁɑ̃sɛːz]) refers to one of the three constituent constitutional linguistic communities. Since 2011, the French Community has used the name Wallonia-Brussels Federation (French: Fédération Wallonie-Bruxelles), which is controversial because its name in the Belgian constitution has not changed and because it is seen as a political statement. The name "French Community" refers to Francophone Belgians, and not to French people residing in Belgium. As such, the French Community of Belgium is sometimes rendered in English as "the French-speaking Community of Belgium" for clarity.The Community has its own parliament, government, and administration. Its official flag is identical to the Walloon Flag, which is also the official flag of the Walloons of Wallonia.